If you like the warm, toasty glow that comes with a tan, there is another way to get the glow without the risk of skin damage. 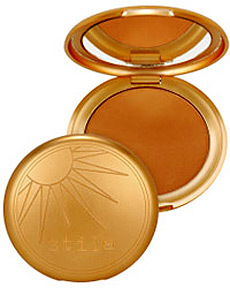 Bronzers like Stila Sun and BeneFit's Dallas can be swept over nose, cheeks and forehead for a natural-looking tan. Stila Sun ($24) comes in three shades, while a limited-edition Stila Sun Highlighter ($24) has a combination of copper color and reflective shimmer to enhance any of the basic colors or to continue adding a touch of healthy looking radiance to your skin for evenings or long after summer's over. Meanwhile, Dallas ($26) captures the sun-kissed rosiness of the outdoor girl and packages it for those of us who prefer the air-conditioning indoors to baking in the sun.